Sign up at either OSHD location. There is no charge to join. Motorcycle purchasers will be enrolled as part of the closing process. New Bike Purchasers earn 1000 bonus points at time of purchase. Rewards points cannot be earned on dollars spent on motorcycle purchases. Used Bike Purchasers earn 500 bonus points at time of purchase. Rewards points cannot be earned on dollars spent on motorcycle purchases. Purchase a Harley-Davidson Extended Service Plan to earn 500 Points. Purchase Guaranteed Asset protection (GAP) and earn 500 Points. Purchase Appearance Protection and earn 500 Points. Purchase Stand Alone Tire & Wheel and earn 250 Points. Referrals which lead to a motorcycle sale can earn 250 Points for the referrer. Service – Spend $1 to earn 1 Point; Excluding Labor, Contract Labor, Inspections, Towing, Warranty work, Extended Service Plan Claims, Accident Repair. Must be customer paid repair order event(s) to be eligible. Earn 100 points per 1000 miles. Begins once customer enrolls, previous mileage is ineligible. Must bring mileage sheet to earn points. All form logging is done through OSHD service departments. OSHD is not responsible for lost mileage sheets. Checking in for meetings and events is the responsibility of the participant and cannot be retroactively corrected. * Once 10000 Loyalty Rewards points are earned, you must redeem them before more points can be earned. Scanning your Loyalty Rewards Card at either OSHD location can redeem points by printing certificate. Loyalty Rewards Certificates Expire after a 30 Day Period. Loyalty Rewards Certificates are not Transferable. (Picture ID may be required). Points earned with LOYALTY REWARDS Cards expire 365 days of your last qualifying purchase. You must make a purchase within the 365 days of your last qualifying purchase, or you will lose your points. Points cannot be combined with some other discounts, sale items or special orders and are not transferable. Points are automatically credited to your Rewards account with each purchase at Russ’ Ocean State Harley-Davidson®. Rewards are available 24-72 hours after purchase. For every bonus event your card must be presented for credit and will be available 48-72 hours from the next business day. Points and rewards have no cash value and rewards cannot be redeemed and placed on account or used to purchase a gift certificate. Loyalty Rewards Points earned on merchandise will be deducted if merchandise is returned. Loyalty Rewards Points are not earned for gift certificate purchases. Loyalty Rewards Points are not earned on items purchased with Loyalty Rewards Certificates or other coupons. Loyalty Rewards Points are not earned on taxes, fees, licenses, sales tax, shop supplies, freight, disposal fees, restocking fees, etc. 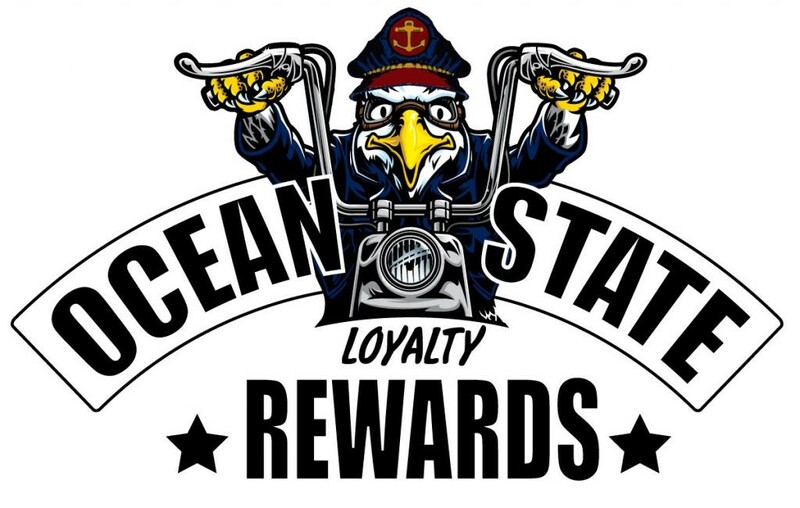 Loyalty Rewards Points are only valid on eligible purchases made at Russ’ Ocean State Harley-Davidson in Warwick, RI and Ocean State Harley-Davidson Shop in Exeter, RI. Russ’ Ocean State Harley-Davidson reserves the right to discontinue Loyalty Rewards privileges and/or void all, or a portion of, a member’s point balance if the points have been issued, received or redeemed through human or computer error, fraud or theft, through illegal means, or in any manner deemed inconsistent with the intent of the Loyalty Rewards Program. All points are given at the discretion of Russ’ Ocean State Harley-Davidson®. Points can be changed, removed or added at any time and hold no cash value. Any or all discrepancies are decided by the Russ’ Ocean State Harley-Davidson® management and the decision is final. Companies and non-retail customers cannot join the Loyalty Rewards Program. 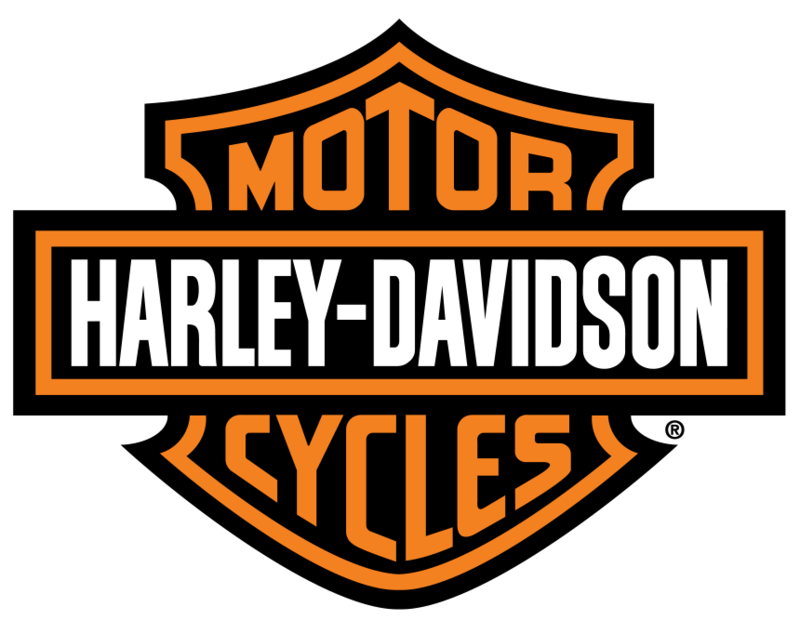 Employees of Russ’ Ocean State Harley-Davidson, its suppliers and immediate families of each are not eligible to participate in the Loyalty Rewards program. When redeeming a Loyalty Rewards Certificate, purchase amount must be greater than Loyalty Rewards Certificate. No credit will be given for the balance. Russ’ Ocean State Harley-Davidson is not responsible for lost, damaged, or stolen Loyalty Reward Certificates. 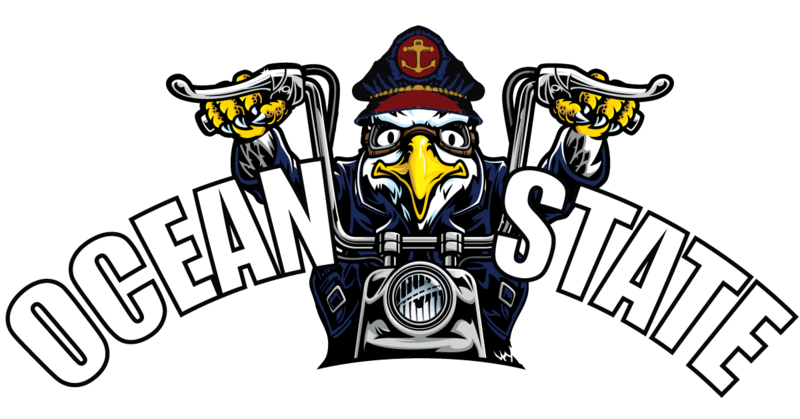 Russ Ocean State Harley-Davidson reserves the right to modify or cancel this program at any time without obligation or notification. Watch for OSHD Emails, Website announcements, OSHD Social Media, and in-store signage for Special Points Days and/or Double Point Opportunities. Rewards under this program have no cash value and cannot be credited to account or redeemed for cash. Rewards cannot be earned on Taxes, Fees, Motorcycle Purchase Value, Gift Certificates, Labor, Warranty, ESP, Accident Repair, Inspections, etc. Card and certificates can only be used by original member or immediate household member. Picture ID may be required. The Terms and Conditions of this program are subject to change without notice. Other restrictions apply see www.oceanstatehd.com/rewards for more information. Who Can Earn Loyalty Rewards Points? How Are Loyalty Rewards Points Earned? You will receive 1 point for every $1.00 you spend at Russ’ Ocean State Harley-Davidson® in Parts, Accessories, General Merchandise, and Service (excluding specially priced items, taxes, bike or vehicle purchase, on-line purchases and certain service procedures including, but not limited to, labor, inspections, collision and warranty work-See store for details). Your first rewards coupon is available at 250 points. Your rewards increase at each point level. You may choose to accumulate points over the course of the program period. Once you decide to redeem a coupon, the points will automatically subtract from your total. Qualified Point of Sale Associates can issue a LOYALTY REWARDS Card and assign the Card number to your Retail account here at the dealership. Points will be automatically credited to your LOYALTY REWARDS account with each qualifying purchase. Points are available 24-72 hours after purchase. For every bonus point event, those points will be available 48-72 hours from the next business day. Points will not be credited for any warranty or accident repairs. Returns are subject to a deduction of points earned from the original purchase. How Can You Track Your Loyalty Rewards Points? Register using the account portal above. You can also stop by Russ’ Ocean State Harley-Davidson or give us a call. We would be happy to look up your balance. How To Use Your Loyalty Rewards Points? Points are redeemed to a coupon that you print by accessing your account through the Loyalty Rewards Page. The coupon will have an expiration of 30 days from the print date. Bring the Rewards Coupon to Russ’ Ocean State Harley-Davidson® to be used toward your next purchase. Points and rewards have no cash value and rewards cannot be redeemed then placed on account or used to purchase a gift card. You may also stop in to Russ’ Ocean State Harley-Davidson and ask us to print a coupon for you. For every $1.00 you spend on Parts, General Merchandise, and Service (excluding specially priced items, taxes, bike or vehicle purchase, on-line purchases and certain service procedures including, but not limited to, labor, inspections, collision and warranty work-See store for details) you earn 1 LOYALTY REWARDS point. Russ’ Ocean State Harley-Davidson® reserves the right to discontinue or modify the Russ’ Ocean State Card Program privileges and/or void all or a portion of the member’s point balance if points or coupons have been issued, received, or redeemed through human or computer error, fraud or theft, through illegal means, or in any manner inconsistent with the intent of the program. Russ’ Ocean State Harley-Davidson® reserves the right to modify or cancel the Russ’ Ocean State Harley-Davidson® Card Program at any time. All points are given at the discretion of Russ’ Ocean State Harley-Davidson®. Points can be changed, removed or added at any time and hold no cash value. Any or all discrepancies are decided by Russ’ Ocean State Harley-Davidson® management and the decisions are final. YES. Your rewards will expire 365 days after your last qualifying purchase. You must make a purchase within the 365 days of your last qualifying purchase, or you will lose your points. Points cannot be combined with any other discounts, sale items or special orders and are not transferable.